I can’t stop listening to Carla Bruni-Sarkozy’s new album, Comme Si de Rien N’Etait. It is upbeat yet soothing and wildly addictive. I particularly adore the track that she sings in her native Italian, il vechhio e il bambino. Her music is fresh and contemporary with a touch of the ethereal and the baroque. 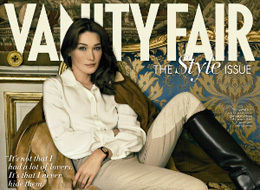 I wanted to call attention to Carla’s musical talents, but of course, everyone has by now seen the cover of the September issue of Vanity Fair featuring the stunning première dame de France dressed in riding boots and breeches, lounging on an 18th century style settee with the caption: “Carla Bruni: The Next Jackie-O?” Do ArtsÉtoile readers think she is the next Jackie-O? I do, she encompasses the elegant simplicity of the American First Lady, plus she is an artiste. Although her former unabashedly libertine lifestyle has raised some eyebrows, the French have been won over by her composure, elegance, and class. Whatever you think of the controversy surrounding Carla Bruni-Sarkozy, you will undoubtedly be seduced by her music. I could not agree more Emily! Carla is the picture of elegance, but with an edge. You’ve convinced me to listen to her music and admire her for more than her presence and beauty (she really does Dior justice). I loved her debut CD “Quelqu’un M’a Dit”.. My booker from Sydney Joseph sent it to me. Granted, he also once recommended Naomi Campbell’s “Baby Woman”, so I was understandably a bit dubious about Ms. Bruni’s efforts, but was beyond pleased once I gave her a chance. Thanks for the reminder about the new release Emily! I’m glad to hear a review by a friend. It certainly makes me what to give it a spin. Bien vu Otto Naumme! C’est vrai que ce Barbier et cette braibe nous rasent. Mais avec cet article vraiment pas décoiffant, on se poile! Humm êtes vous certain de ce que vous nous affirmez ? a title that grabbed people’s attention? I mean J�adore Carla | ArtsÉtoile is a little boring. You might peek at Yahoo’s front page and watch how they create post titles to grab people to open the links. care of to keep it wise. I cant wait to learn much more from you. newsletter service. Do you’ve any? Please let me understand in order that I may subscribe. you are knowledgeable on this subject. Fine along with your permission let me to take hold of your RSS feed to stay updated with impending post. neighborhood. For people who frequent gambling houses, it might not be difficult to resolve. However, for those who stay away from casinos, this could be something troublesome to spell out. authority in the field of recreation. UK alone, gambling online traffic was up by 40% over 2009.
some 16% of college-aged men visited online casinos one or more times a month, up dramatically over 2008 figures. including Roulette, Craps, Blackjack, Baccarat etc. games. Rome Casino as an example offers players an ‘Ancient Rome’ theme for their games. I really like Party Casino’s software and Casino.com’s. Their software packages are really advanced, fluid in addition to their games options are fantastic. allow USA players to utilize their gambling software. Customer service is essential for any online shop, but particularly to the high stakes gambler. casino site’s banking methods to see if they accept different currencies. Also question the casino’s withdrawal limits. every online casino you could possibly come across with on the web. that you can encourage a person to continue playing. to any other kind of addiction as the addiction begins to take charge and control your life. line in terms of increased efficiency, increased productivity, etc. instead of soccer. This is a competitive advantage for sports betting businesses because the options that it gives are more than what anybody expects. Hi to every one, it’s truly a pleasant for me to go to see this website, it contains valuable Information. Thanks for finally talking about >J�adore Carla | ArtsÉtoile <Liked it!